What does a bird have to do to get some relief from this heat? And what in the world is this bird’s problem? Is he hurt? Sick? Drunk? Well, no – just hot and bothered. Summer arrived with a hot, muggy THUMP this past weekend. Only the first of June, and already well into the year’s first heat wave. 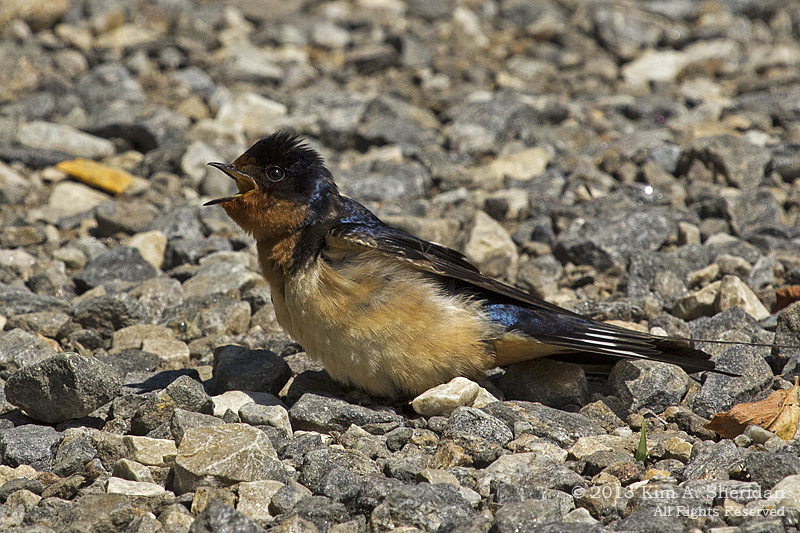 On Heinz Refuge trails, groups of young Barn Swallows (above) were behaving very strangely. 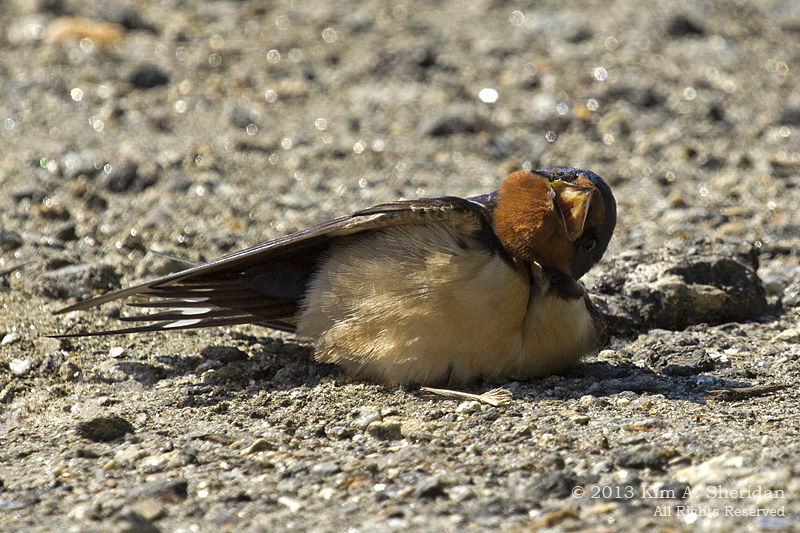 Birds don’t sweat, so they will leave their mouths open wide to facilitate evaporative cooling. Just like dogs pant. 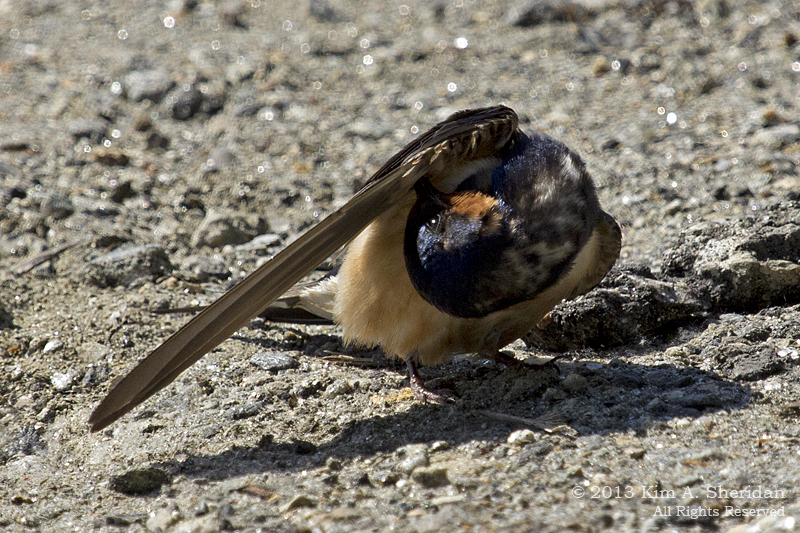 Birds are also often bugged (sorry) by ectoparasites, little insects and mites that get under their feathers. Rolling around in the dust helps get rid of the pests. Another way is known as “anting”, a little-understood behavior that involves letting ants crawl over their bodies. The theory is that ants secrete some substance that is toxic to the ectoparasites. Hey, if it’s ants these little birds want, they can come over to my house – I’ve got plenty! Nesting birds were bothered by more than the heat this day. 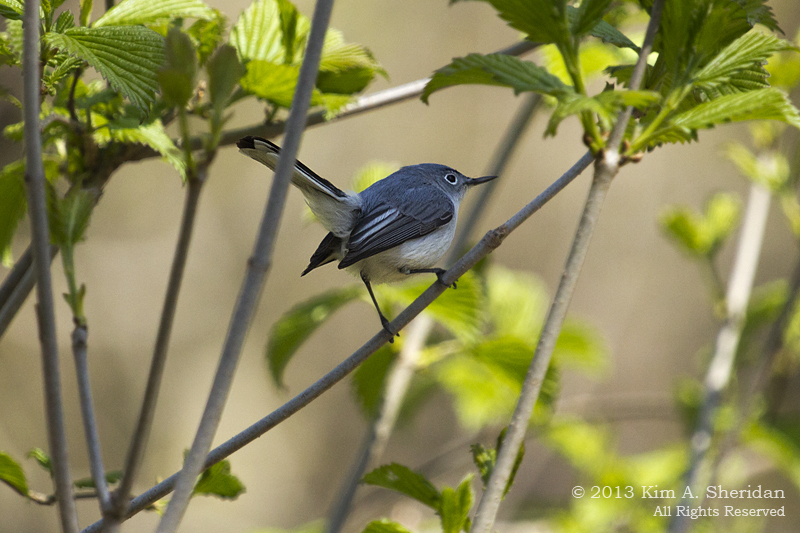 I saw a Blue-gray Gnatcatcher (above) chasing a much larger American Robin, and a Robin chasing a squirrel! A good mother will take on anyone who threatens her young. 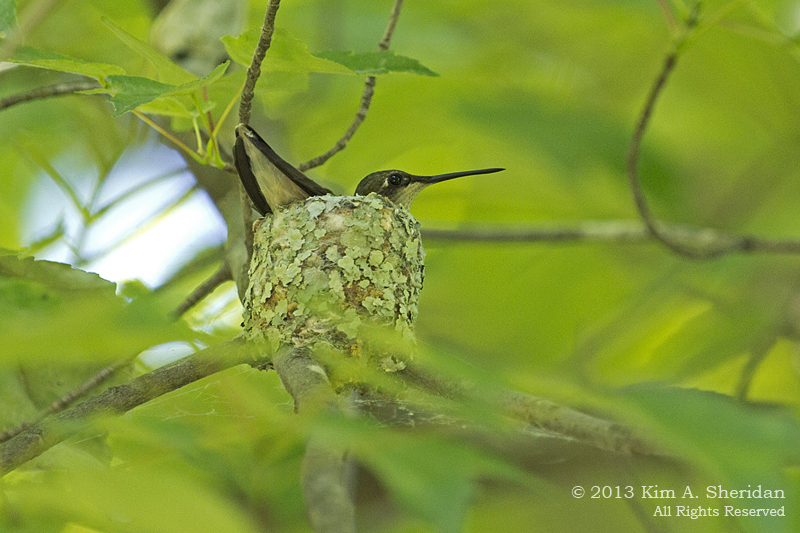 We found a nest built by a female Baltimore Oriole (right), and a Ruby-throated Hummingbird (below) sitting on her nest. FUN FACT: The camo look you see in the Hummingbird nest comes from a covering of lichens, held together with spider silk. Hummingbirds are the only birds that can fly backward! Then there were these odd ducks. Geese, actually – SNOW Geese. Snow Geese nest in the far North, and winter in huge flocks (but not at Heinz.) The irony of three migrating through just in time for a heat wave was not lost on anyone. 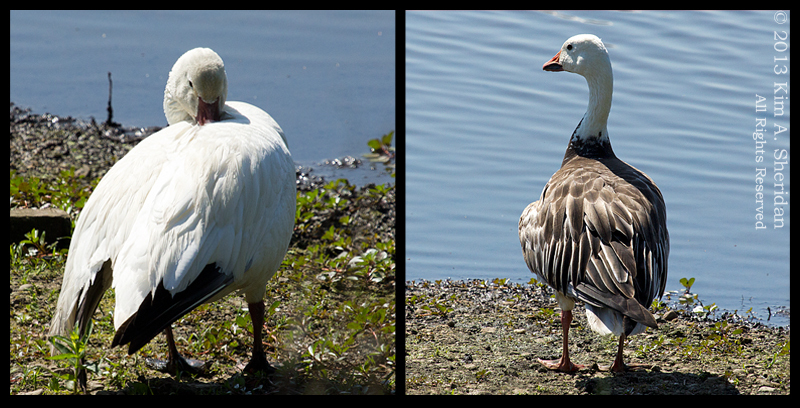 The dark Goose is a relatively unusual color morph of the Snow Goose. Known as the “Blue Goose”, it’s the mascot of the National Wildlife Refuge System. Of course, Gray Catbirds know that nothing soothes the savage beast on a hot day better than a nice cool bath. 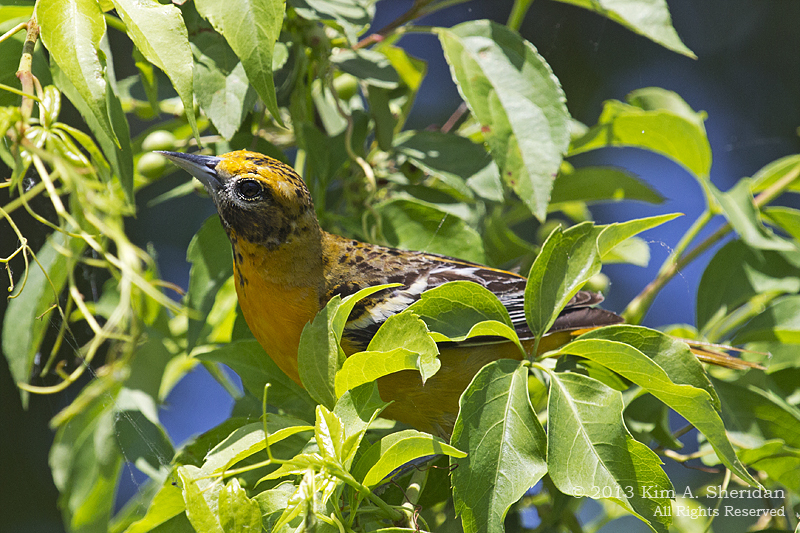 This entry was posted in Birds, Nature and tagged Birds, John Heinz National Wildlife Refuge, Nature by Kim. Bookmark the permalink.